Edgar Wright is back in London editing Scott Pilgrim and lucky for us, he’s continuing his supercool The Wright Stuff double bill series at the quite-good-but-not-as-good-as-people-make-out Prince Charles Cinema. 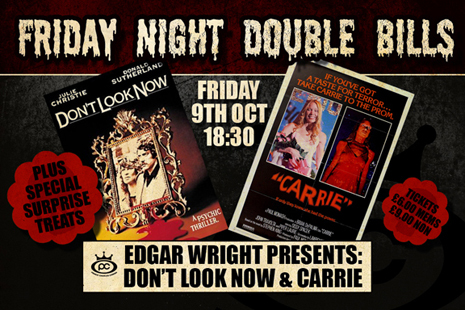 To kick things off there’s a double bill of Don’t Look Now and Carrie next Friday (the 9th). Nic Roeg’s Don’t Look Now starring Donald Sutherland and Julie Christie is a superlative supernatural film with some of the best editing in cinematic history. It’s been an influence on many a film over the years including The Sixth Sense and (yes) Shaun of the Dead. If you’ve never seen it, don’t miss a chance to see it on a big screen. It’s haunted me since I first saw it one late night on BBC2. And Brian De Palma’s Carrie is simply magnificent. In my opinion the best Stephen King adaptation with a simply amazing cast: Nancy Allen, Amy Irving, PJ Soles, John Travolta and two Oscar nominees Piper Laurie and Sissy Spacek. Add in De Palma’s amazing visuals with incredible continuous takes, split screen and backwards flashbacks, plus Pino Donnagio’s incredible score and you have a stone cold classic. At the box office, off Leicester Square. Over the phone on 0870 811 2559. Supposedly online but it’s not working at the time of writing.